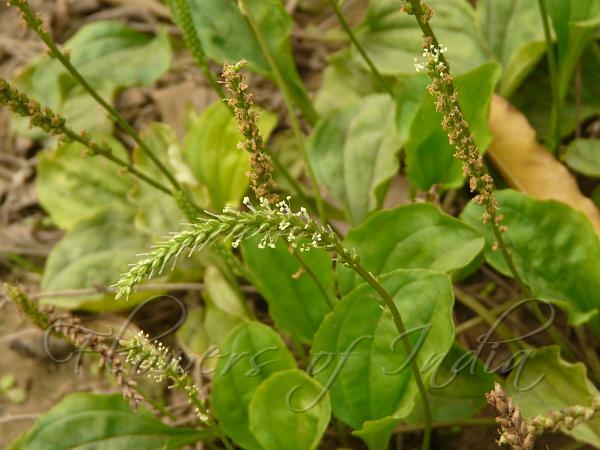 Broad leaf plantain is a perennial herb, variable with short stout, erect, truncate, rootstocks and numerous adventitious roots. Leaves appear in rosettes, spirally arranged, stalked, sometimes not clearly distinguished into stalk and the blade. Leaves are ovate-elliptic or rarely circular, 10-20 cm long, 4-9 cm broad, rounded at the tip, entire, nearly entire or slightly toothed, 3-9 nerved, nerves divergent at the base. Leaf bases taper into long sheathing stalks usually equalling the blade. Leafless flowering stems are many, 13-15 cm long, arched, erect. Flower spikes are dense or lax, slender, narrow-cylindric, 5-15 cm long. 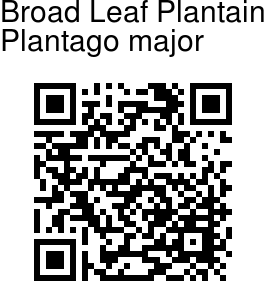 Bracts are equal to or shorter than the sepal cup, ovate-oblong, acute, brownish with a brown keel. Sepals are broadly elliptic, oblong to rounded obtuse. Flowers are greenish or yellowish white, 2-4 mm long, petals elliptic-ovate to narrowly triangular, 1-1.15 mm long, obtuse or acute, reflexed. Anthers are at first lilac, later whitish or yellowish. Flowering: August-October. Photographed in Talkatora Garden, Delhi.